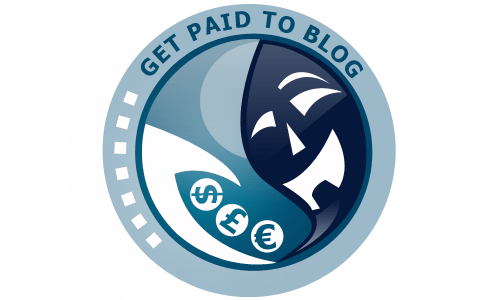 Let’s say you have a blog that accepts posts from the general public. 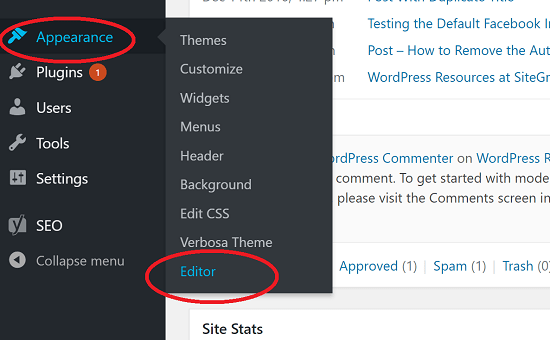 You allow people to sign up, write their posts in the WordPress editor, and then send them to you for review. If you think it’s fine, you publish them, otherwise not. Lots of WordPress sites do this. However, in order to prevent people from publishing their posts, you only allow them to sign up as a “Contributor” instead of an author. Authors can publish posts. Contributors can’t. This is a useful distinction where you want to have control over what appears on your site. It works great, except for one slight problem – contributors can’t upload images! Why Do You Want Contributors to Upload Images? These days, articles aren’t complete without pictures. Whether they’re graphs, or screenshots, or some other illustration to make a point, images are crucial for improving the quality of articles. Without images, articles look bleak. So if you’re looking for high-quality posts from contributors, chances are that they will include images. But if contributors are not allowed to upload images to their posts, then they’ll have to send the pictures to you separately – perhaps by e-mail. And then you’ll have to manually find out where they wanted to insert the images and do it yourself. It’s time-consuming and doesn’t really add any benefit. People who want to write for you will get frustrated as well, knowing they can’t upload images. 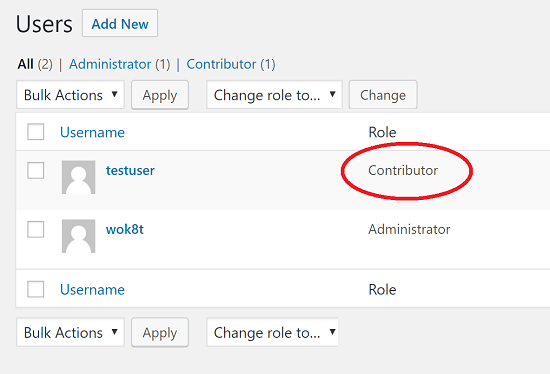 So in this tutorial, I’ll show you how to modify the contributor’s role to allow access to the media library. As you can see, the familiar “Add Media” button is missing. Normally, this allows us to access the media library, upload, and insert posts. 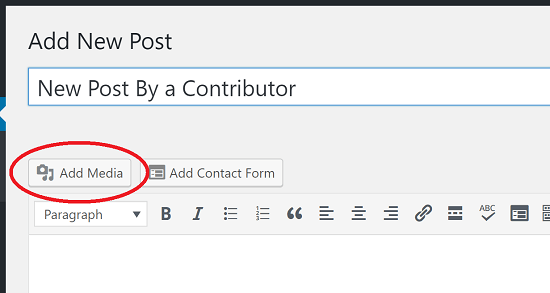 What we want, is for this missing media button to become visible to contributors. If you do see it, delete it. It’s a remnant of an old coding standard in WordPress and is dangerous. After you’ve pasted the code, click the blue button labeled “Update File” to save your changes. As you can see, the button labeled “Add Media” is now visible! Contributors can now upload and add images to their posts like everyone else. But don’t worry! They still can’t publish posts or otherwise harm your site in any way. 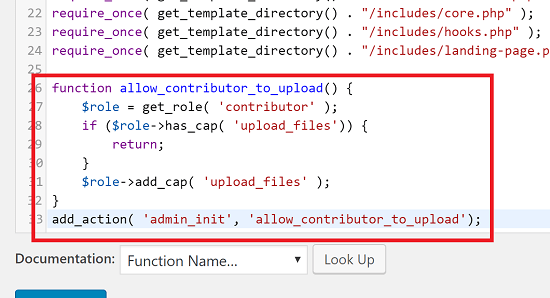 Now there’s no need for you to manually insert images into contributions! There is one danger though. People can upload images to your site and then access them via their URL from whenever they want. If someone wants, they can turn your site into a kind of CDN for their images! I’m not sure why anyone would want to do this, but it’s possible. So to be on the safe side, just go to your cPanel account and enable hotlinking from the “Security” tab. It’s a good idea to have this enabled anyway to keep your images safe. So now’s as good a time as any to do it! I hope this tutorial was useful to you and allowed you to streamline your workflow for new post submissions! 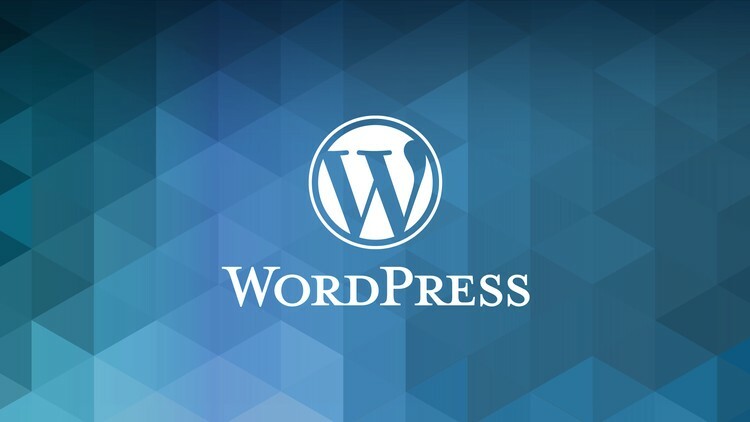 Bhagwad has been developing and writing on WordPress for over 8 years. He’s published WordPress plugins, Android apps, and Chrome extensions. He also runs WP-Tweaks.com where he compares web hosting offers from providers like SiteGround, and coupons from Bluehost, Hostgator, InMotion, and other major hosting providers.